2Lt William C. DaShiell (P) - First mission #83 on 26 November 1943. Flew first 3 credited missions as CoPilot with 2Lt Aubrey L. Emerson crew (83, 84, 85, 86). Upgraded from CoPilot to Pilot with mission #89 on 16 December 1943. Flew 5 credited missions as 1st Pilot with 2Lt Hilton C. Mabie as CoPilot (89, 91, 93, 97, 98). 1Lt Walter A. Kyse (Instructor Pilot) - Appears in crew photograph but flew no combat missions with the William C. DaShiell crew. 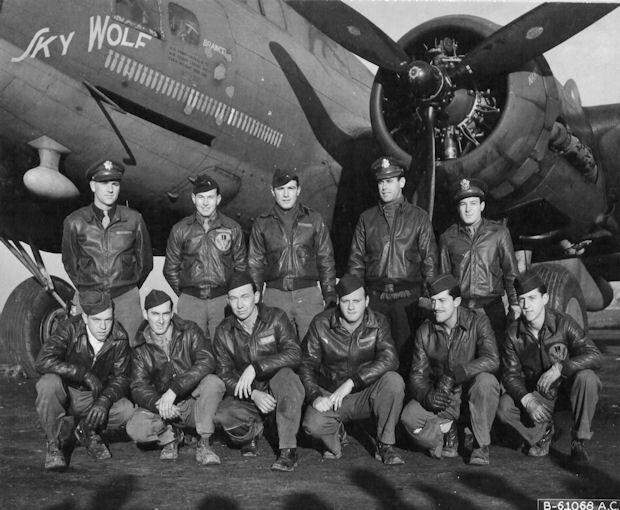 The 10 men on the DaShiell crew were Killed in Action 11 January 1944 on Mission #98 to Oschersleben, Germany. Regular crewmen DeLaura (B) and Morrison (TG) were not with the DaShiell Crew on that mission. Also KIA were S/Sgt George H. Fee (TOG) and Sgt Robert A. Parker (WG). Grave Marker at the Jefferson Barracks National Cemetery in St. Louis, Missouri. The plot is Graves 17, 18 and 19, Section 84. Click for larger image. 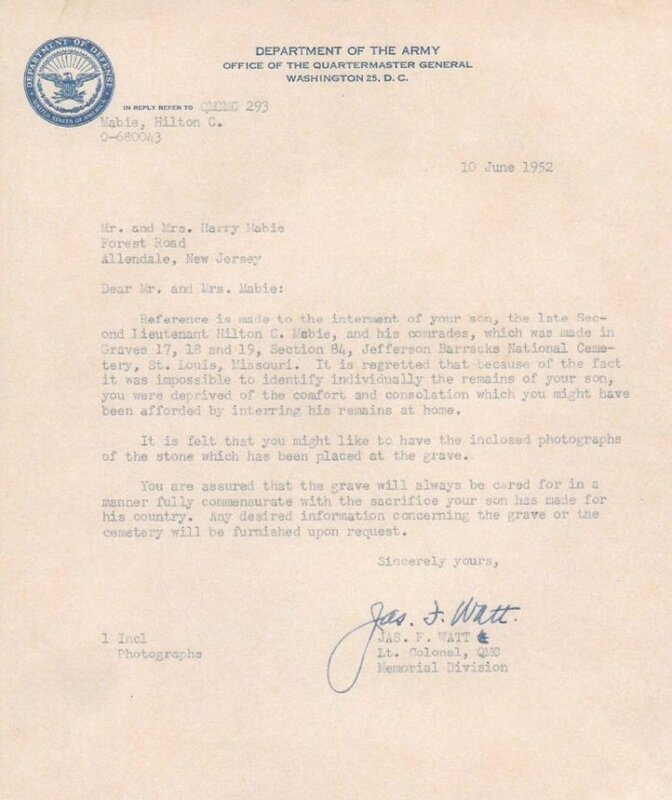 The letter above was sent to the family of Hilton C. Mabie on 10 June 1952, along with the photograph of the grave marker above. Click the letter for a larger view. Fortunately, today's DNA testing will prevent any more families from receiving letters like this. 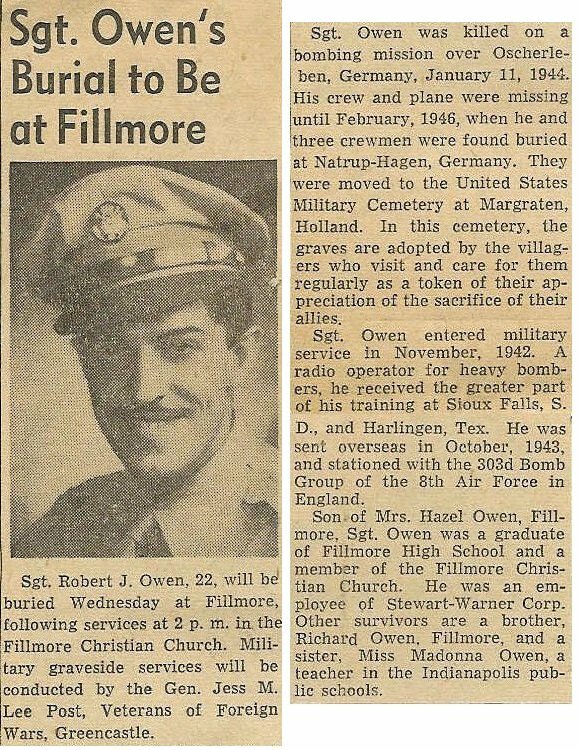 Click the Owen Obituary at the left to view the entire obituary.